Pescador de Sueños Arroqueno has notes of bright and herbal roasted agave with sweet fruity flavors and a full mouthfeel. This mezcal is made with the mighty and grand wild agave Arroqueno in Sola de Vega, Oaxaca. Tio Fernando’s family has been making mezcal for generations and he distills all his mezcal in small clay pots, which is common in this particular region of Oaxaca. Pescador de Sueños Mezcal is a project of the Santa Sabia Distillery. They present unique collections of select mezcales in hope of rescuing the mysticism and folklore of this ancient Mexican tradition. 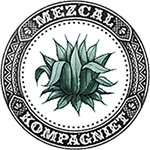 The mythical emphasis of the brand shows in their name as well, which means “the fisherman of dreams.” They focus mostly on small-batch, rare mezcals that are exported mostly to Europe.